Cilantro Lime Salmon Cakes with Chipotle Mayo made for a delicious, new way for us to enjoy salmon. Kim tells us how it went on Tuesday night. I had never made anything like salmon cakes before but the recipe seemed very straightforward and despite having several steps, simple enough for a week night. Like many of our recipes, I made only half. The recipe called for a skinless salmon fillet; mine was not skinless but I guessed the skin would come right off after I roasted the salmon. I only needed to roast my piece of salmon for 10 minutes and then slid it right into the fridge on the sheet pan to cool. As the recipe suggested, while the salmon was roasting, I made the chipotle mayo. We had both chipotle in adobo and chipotle flakes around and since the author of the recipe preferred chipotle powder, I thought why not grab our spice grinder (actually a coffee grinder we only use for grinding spices) and make our flakes into powder. The experiment worked and the chipotle mayo came out perfectly with a nice amount of spiciness. Even with this extra step of making the adobo powder, I still had plenty of time to make the mayo and clean up a little bit before moving on to other parts of the recipe. Again, as the recipe suggested, while the salmon was cooling, I prepped the other ingredients for the salmon cakes. Because the whole recipe called for one beaten egg, I just guessed a little bit on what half a beaten egg was. Once all the other ingredients were ready to go, the salmon had cooled and my guess that the skin would come away easily as I flaked the salmon was accurate. I was very glad I didn’t struggle with trying to skin my own salmon before cooking. 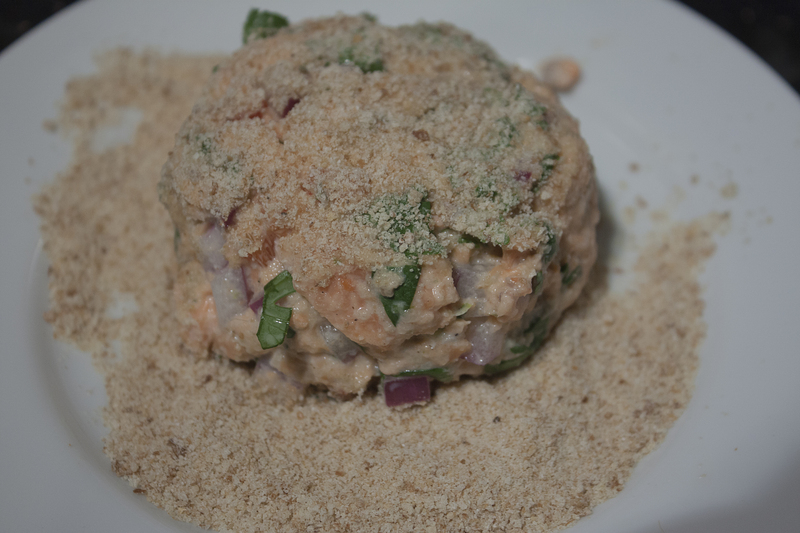 Mixing the ingredients for the salmon cakes was exactly how the recipe described—it was very easy to get it to a “moist tuna salad” consistency. I dipped the cakes into the bread crumbs and got them going in a skillet. Mine took a little longer than two minutes a side to brown. They took about 4 minutes a side and while I had to turn up the heat a little bit from medium just to get them going, I eventually turned it back down to medium. I suspect this might have been because I was using a non-stick skillet. The salmon cakes came out gorgeous and browned perfectly. I plated them with a dollop of the chipotle mayo on top and paired with nice green salad with a few chives sprinkled in. The salmon cakes were incredibly flavorful with wonderful texture of tender salmon and a slight crunch from the onion and red pepper and the chipotle mayo was a perfect accompaniment. I’ll definitely be making these again and agree with the author of the recipe—they’d be great for company too.